This reminds me of a casserole my mom used to make while we were growing up. Even back then, I thought it was just delicious! Thank you for sharing with us Chris! This recipe was featured in Adrian’s Boutique’s “Between Friends” Cookbook (page 122). Saute sliced zucchini, tomatoes, butter and onion in a skillet until bubbly. Add flour, salt and pepper to absorb liquid. Separately, mix eggs, half & half, brown sugar and more salt and pepper. 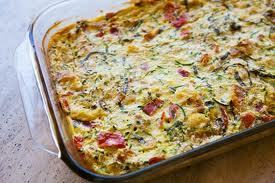 Spray casserole dish with Pam, add veggies, cover with egg mixture and sprinkle with both shredded white cheese and grated parmesan cheese. Bake at 375 degrees for 30 minutes or until bubbly.